The cars are fast, the trash talk faster, and the boy’s club is about to be blown wide open. Holly “Legs” Nelson is on the move as the first female NASCAR driver. But, of course, all the men say she’s cheating. It’s fast-paced action that swerves and spins around the driving competition, the endearing loyal fans, and the back-road karaoke bars. See it all unfold as a cast of six women play everyone from the announcers to the drivers and a surprise racing legend all in the pursuit of high-octane glory. So goes Vrooommm! : A NASComedy, the new gender-bending offering from Triad Stage directed by David Karl Lee, which opened Jan. 30 to a sold-out crowd. It will close out the company’s Winston-Salem season with a bang (well, several bangs and other assorted loud noises) this week at the Hanesbrands Theatre. On and off the track, the action is constant in Triad Stage's Vrooommm! Janet Allard’s “Vrooommm!” waved a green flag over a full house at its opening on Friday night. The Hanesbrands Theatre audience was treated to a multi-colored look at what might happen on the track, in the locker room, at the garage and even in a number of karaoke bars when a woman invades the world of male race car drivers. Triad Stage's first offering of 2016 is a laugh-out-loud comedy that may, to some, seem a bit ridiculous. Billed as a "NASComedy," VROOOMMM! places six female actors in over 20 different roles – including men and mobster chickens – following the events that occur when female driver Holly "Legs" Nelson (the stunning Eliza Huberth) enters the male-dominated race...and keeps on winning. Ricky Bobby isn’t the only character that likes to go fast; in fact, one driven female might have just given him a run for his money if she had crossed the track from the stage to the screen. While Talladega Nights,the movie, highlights the male egos of NASCAR, the play VROOOMMM! focuses on the plight and success of the first female driver in the male-dominated world. Except for some early pioneers when NASCAR was formed in 1949 — and a few regulars starting in the 1970s — women drivers have been rare in the upper echelons of the sport. When playwright Janet Allard took on the subject of women in American car racing in “Vrooommm!,” first produced in New York in the summer of 2007, Danica Patrick hadn’t happened to NASCAR yet. 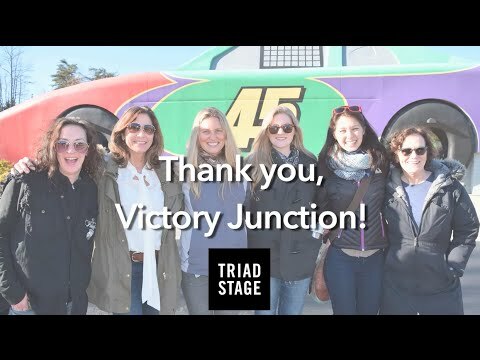 Triad Stage brings racing to Winston-Salem stage with VROOOMMM!